The bed was so comfortable we had both slept like logs and didn’t stir until our alarm went off at 8.00 a.m. Complimentary breakfast is served in the restaurant located just behind the reception area on the ground floor. 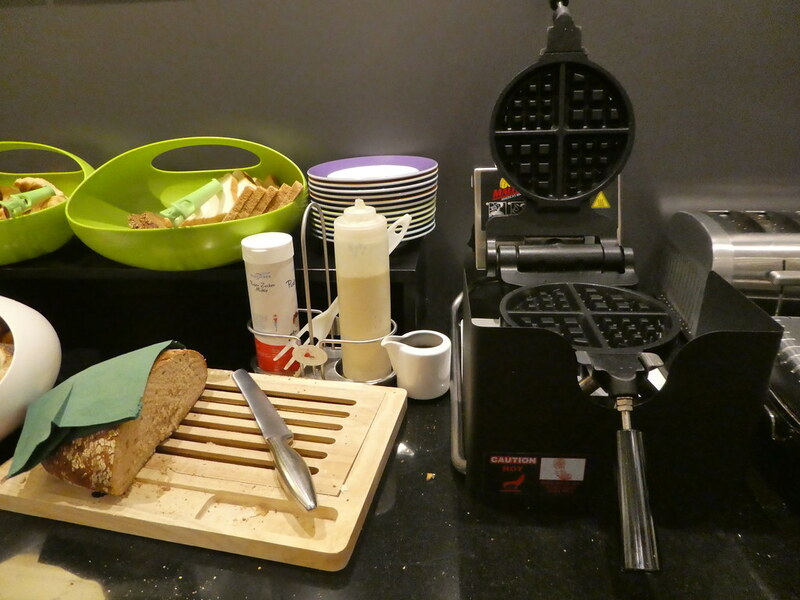 As well as the usual array of fresh fruit, yoghurt, cheese and cooked meats I was delighted to find an electric waffle maker complete with batter in a nearby jug, ready for pouring. 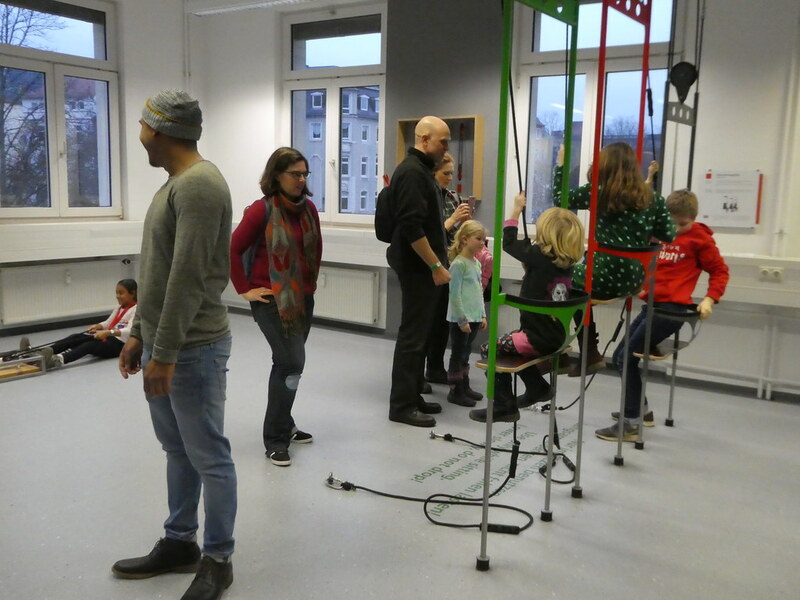 After being tempted into over indulging in extra Danish pastries and chocolate croissants we made a move and got ready to start exploring the city centre, The IBIS hotel was just a five minute walk to the nearest U Bahn (underground) station at Hauptbahnhof. We didn’t need to buy tickets as we had validated our Frankfurt Cards for use. These cards which are available in either one or two days duration cost €10.50 (£9.30) and €15.50 (£13.75) respectively. 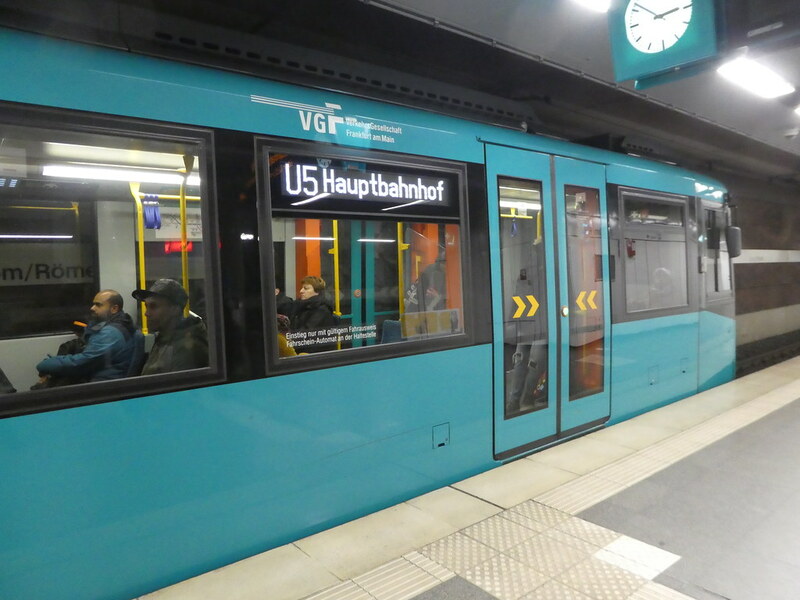 Frankfurt Cards offer free travel on the city’s public transport system which includes trams, buses, underground and suburban trains and up to a 50% discount on admission to its museums and attractions. The U Bahn was easy to navigate and seemed rather quiet for a Saturday morning in a large city. Stations do not have any barriers so passengers just need to ensure they are in possession of a valid ticket or the Frankfurt Card before travelling. We took the train two stops to the Römer / Dom station which brought us out near where we had walked the previous evening and close to St. Bartholomew’s Cathedral so we decided to look in there first. Restoration work was taking place inside the church resulting in large sections being covered. 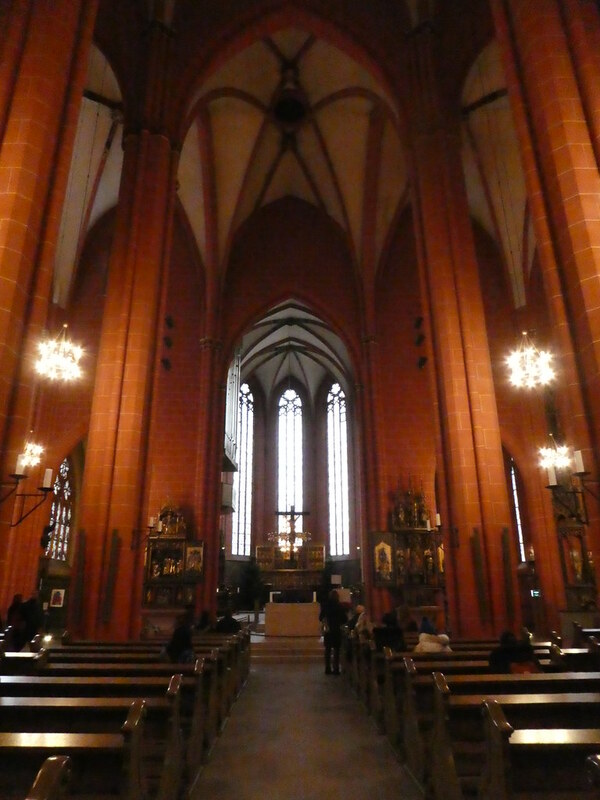 The remainder of the church was beautiful with its neo-gothic architecture. The original church was established here in 1356 and between 1562-1792 monarchs were crowned emperor at the coronation altar. The present church is the fifth structure on the site and it takes its appearance following restoration after suffering war damage. Entrance to the Cathedral is free and it is usually possible to climb to the top of the 95m tower but this was closed at the time of our visit. Leaving the Cathedral we wandered into the adjacent Römerberg Square which lies in the heart of the old town. The weather might have been dark and gloomy but set out around us were some beautiful buildings. Frankfurt was once home to Germany’s largest timber framed old town but after an air raid in 1944 the district was almost entirely destroyed. It has since been painstakingly reconstructed using some of the original stones. Fifteen buildings have been re-built as exact replicas of the original buildings with a further twenty new buildings featuring the typical half timbered Gothic style architecture. In the centre of the cobbled square stands the Fountain of Justice with the statue of goddess Justitia holding the scales of justice. There were few people about at the time of our visit but I could just imagine the scene during the warmer months with outdoor terraces spilling out from their restaurants onto the square and the place buzzing with activity. 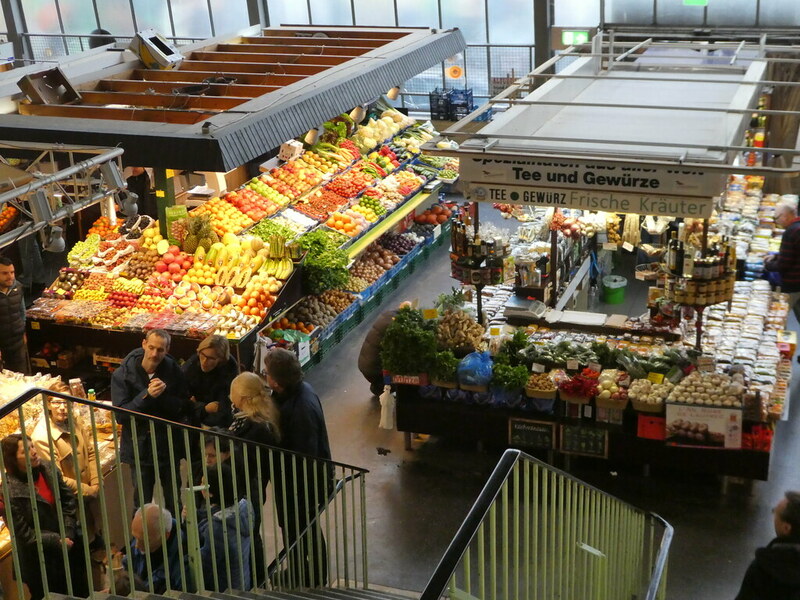 Continuing our tour of the old town we strolled the short distance to Frankfurt’s indoor market hall, known as the Kleinmarkthalle. The market is open six days a week (closed Sundays) and boasts almost 160 food stalls selling fresh produce, fruit and flowers. It was lovely wandering around the stalls, sampling salami and cheese on our way. It’s a food lover’s paradise offering traditional regional specialities in addition to a superb assortment of international delicacies. Leaving the market, we consulted our phone map and made our way to the river, arriving just in time to take the Primus Linie sightseeing cruise. 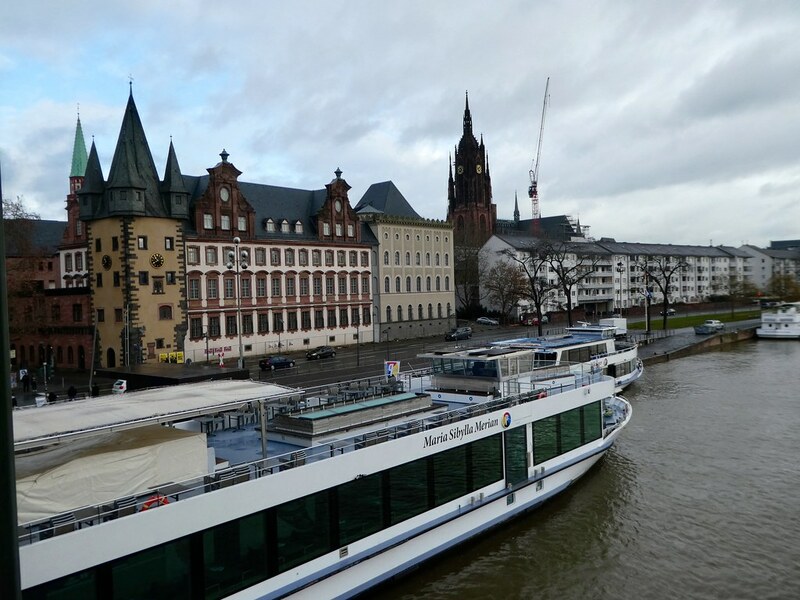 The company runs two 50 minute sightseeing trips up and down the River Main and these can be combined into a full tour lasting 100 minutes which we decided upon, costing only €3 more at €12.90 (£11.25) 20% reduction for holders of the Frankfurt Card). 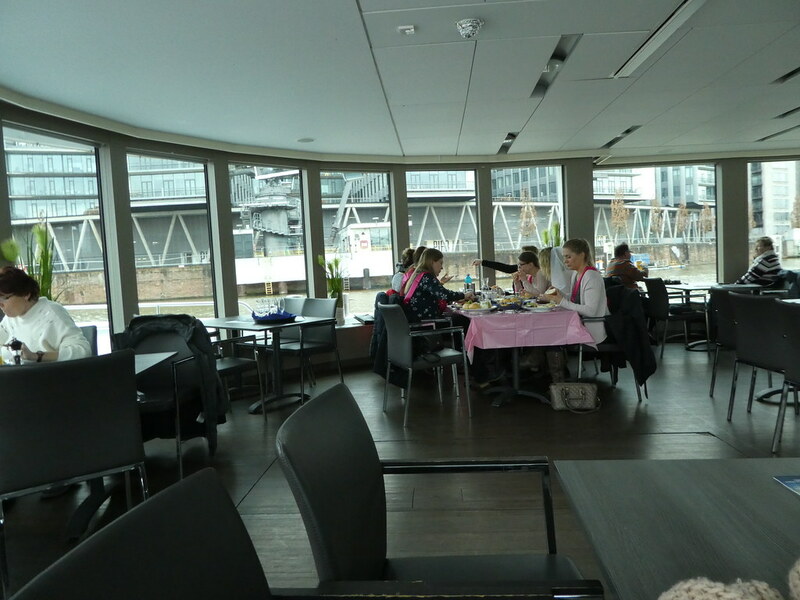 It wasn’t the weather for sitting outside on the sun deck so we opted for comfortable seats in the spacious restaurant from where we could keep warm and cosy whilst enjoying the ever changing views through the large windows. As the boat passed places of interest such as the gleaming tower of the European Central Bank or the Cathedral, a short, informative commentary could be heard. I’m pleased we decided to take the sightseeing cruise as it provided us with a different perspective of the city from the water. It was almost 1.00 p.m. when we disembarked from the boat and we were beginning to feel a little peckish so we walked along to the main square where we came across Weinstube in Römer which looked attractive, so we popped in there for some lunch. We both felt like soup to warm us up and the thick onion soup topped with melted cheese tasted delicious and was very filling. 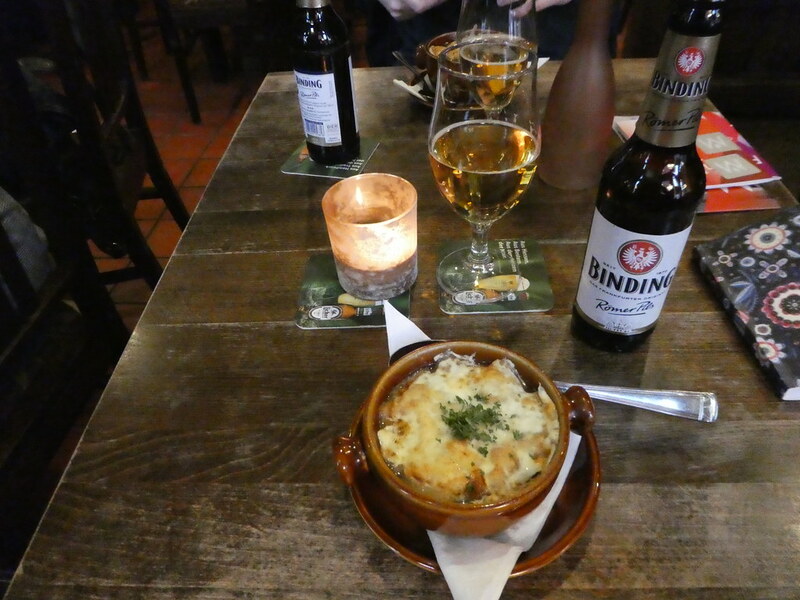 We accompanied the soup with glasses of local Binding Römer Pils beer and the bill came to €19.80 (£16.95) for the two of us. Feeling refreshed it was just a few steps across the square to our next attraction, the Historisches Museum, Frankfurt entrance €12 (£10.25) with a 50% reduction for holders of the Frankfurt Card. The museum is large and is housed in two inter-connected buildings which at first we found a little difficult to navigate but armed with a map and the help of some museum staff, we managed to find our way around. The museum chronicles Frankfurt from the Stone Age to present times and we particularly enjoyed the ‘Frankfurt Jetzt’ (Frankfurt Now) gallery which contained a large scale model layout of the city. It was intriguing to see that everyday objects had been used such as TV remote controls to depict airport terminal buildings and skis for bridges. On the lower floor we viewed a giant snow globe which showcased many facets of the city. This amazing plexiglass exhibit is raised from an illuminated basement below by an industrial robot. 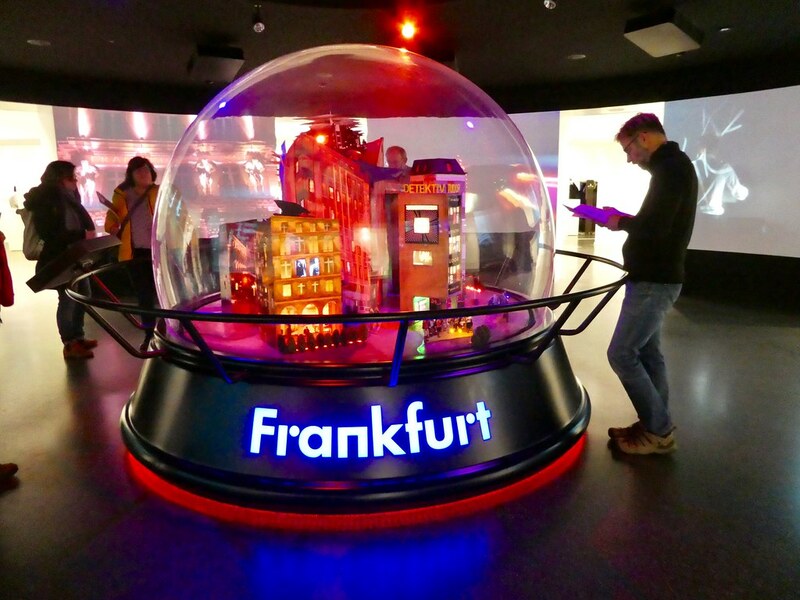 Visitors can select 8 different aspects of Frankfurt at the touch of a button, be it as a leading financial centre or an industrial hub. Pressing the button, it took three minutes for the robot to move the models up and down and once in position each illuminated model rotated for three minutes inside the snow globe. I had never seen anything like this before and found it to be ingenious and a spectacular way of showcasing the city. Having learnt a little about Frankfurt’s history we decided it was time for some fun so we took the U Bahn to Messe/Festhalle station, from where we transferred to a No. 16 tram to the Experiminta Science Centre, admission €11 with a 50% reduction for holders of the Frankfurt Card. There was quite a lengthy queue to enter as we’d arrived at a peak time (Saturday afternoon). 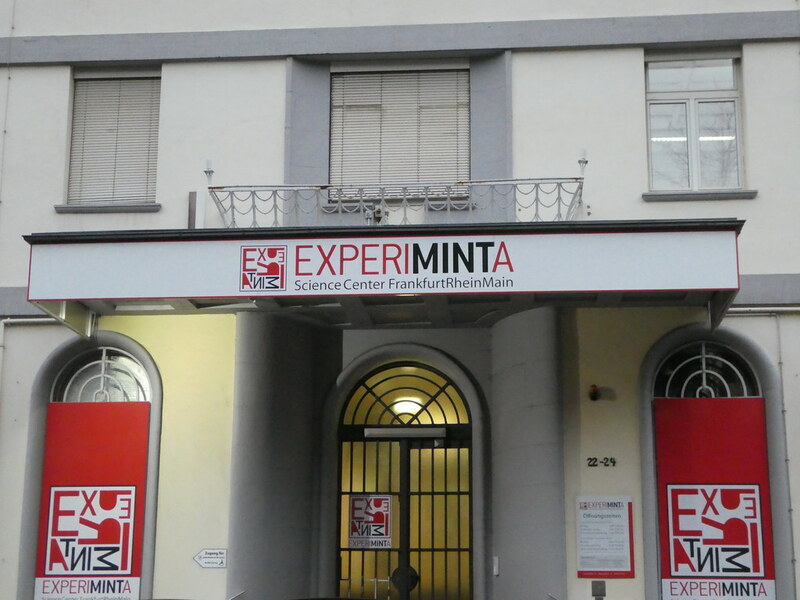 The museum is housed in an old building with numerous small rooms each covering different scientific themes. Each exhibit on the ground floor had signage in English but sadly on the upper floors it was rare to find any exhibits with explanations in other languages but we were able to work out some of the exhibits for ourselves. We had fun trying the many experiments and the museum kept us interested for around 90 minutes. We love visiting Science museums and try to track them down wherever we visit and although this one was reasonably good it didn’t compare with the Copernicus Science Centre in Warsaw or the Hong Kong Science Museum, both of which we’d previously visited. 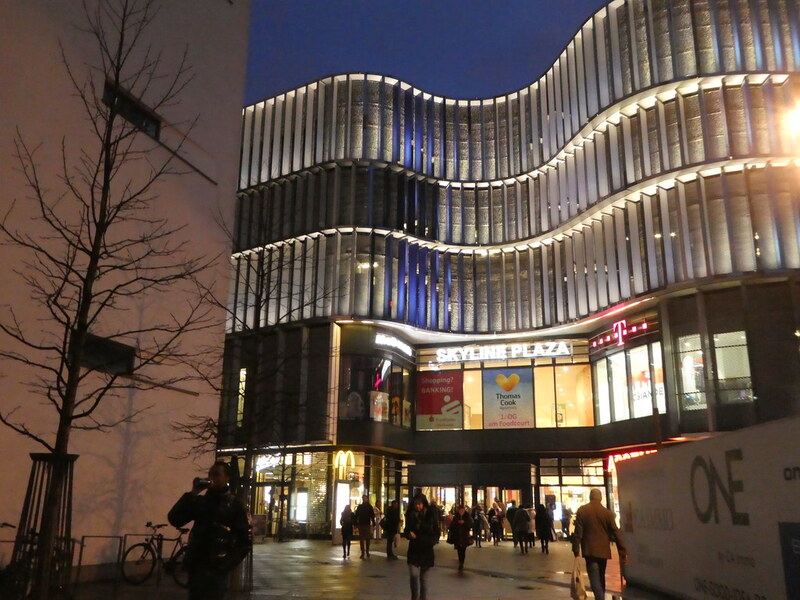 As we left the museum it was raining heavily so we hopped back on a tram to the Messe/Festhalle stop to look around the SkyView Plaza Mall awhile. This gave us an opportunity to keep dry, look around some of the shops and stop off in one of the cafes for afternoon tea and cakes. 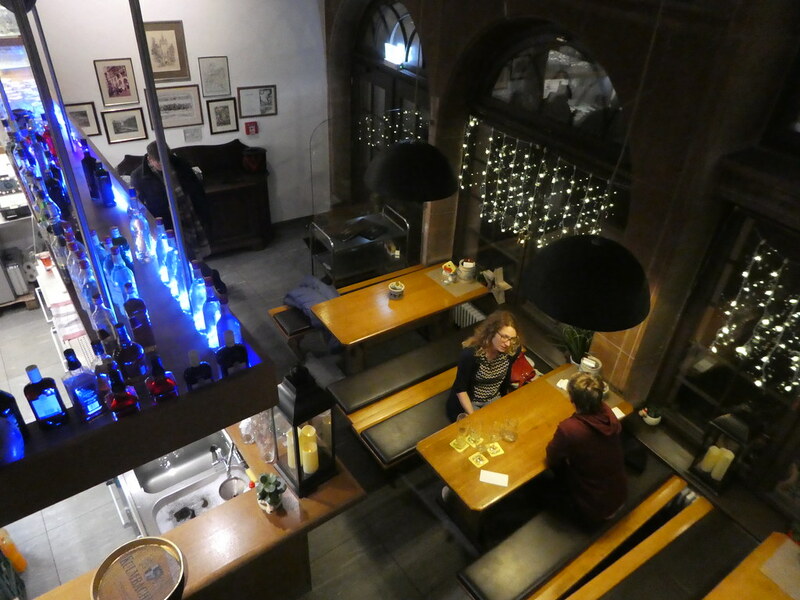 After our dose of retail therapy we took the U Bahn back to our hotel for a short rest and later enjoyed a meal back in another of the old town pubs, this time selecting Römer Bembel where we found a cosy table on its balcony. Sounds like a wonderful day exploring Frankfurt. I love that snowglobe, such a clever idea and can’t say I’ve ever seen something similar either. Frankfurt was great and you’re right that snowglobe was very unusual but very interesting. Have a good weekend Jason are you off to Seattle soon? Frankfurt looks like a lovely city, so much to see and do. Travelled around Germany a lot but not visited Frankfurt so will have to rectify that very soon. The architecture is fabulous and especially love the model city and the snow globe. Thanks Jonno. I’m sure you were enjoy a few days in Frankfurt as it is such a fascinating place. Germany is one of our favourite countries so anywhere, especially in the south, is great to visit. Wonderful food and drink too. Thank you. I do hope you get an opportunity to visit Frankfurt sometime! Lovely photographs speaking volumes about the surroundings. It did seem like a virtual tour, each and every detail so vivid. Happy travelling! 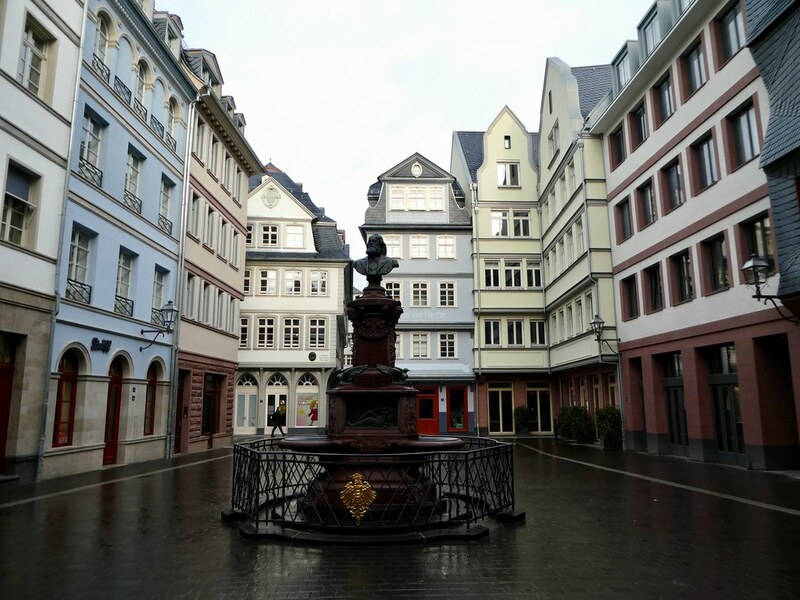 Thank you for your kind words, it’s so nice to read that you enjoyed this post on Frankfurt. A feast of architecture, the old and the new in contrast and yet blending in. We loved our trip through Europe. My wife’s memories are more of Germany growing up than her country Hungary. That’s interesting to read Ian. I enjoyed our weekend stay in Frankfurt very much. The buildings surrounding the old square have been rebuilt absolutely beautifully and do look so pretty. Thank you for your kind words. 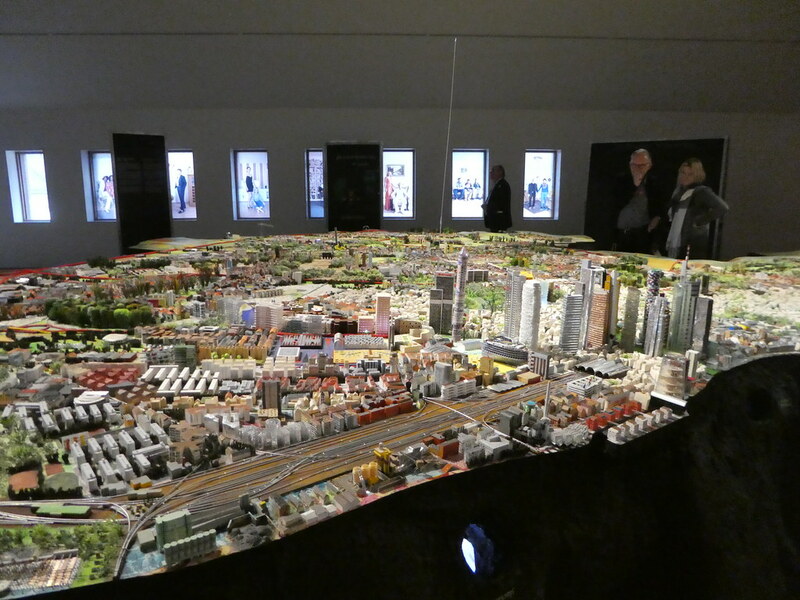 It’s so nice to read that you enjoyed this post on my recent visit to Frankfurt. Enjoyed reading about your Frankfurt visit. Thanks Dev for taking an interest in this series of posts on Frankfurt and for your much appreciated thoughts. Thank you Misha for your kind words. 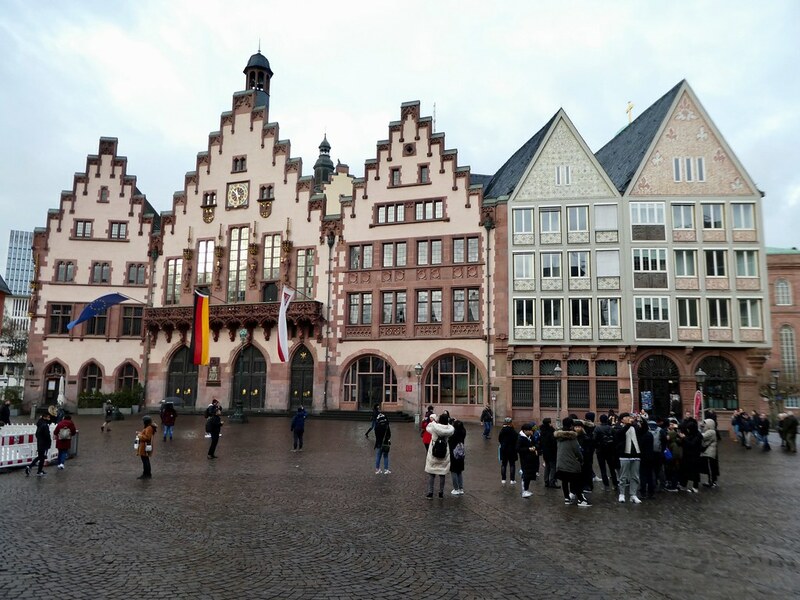 Germany is indeed a really interesting country to visit and I’m sure you would enjoy exploring Frankfurt. I really enjoyed reading this very detailed guide! We hope to do Eastern Europe and then the rest after se Asia and China. Thank you for taking an interest in this series of posts in my recent visit to Frankfurt. I’m sure you would enjoy visiting the city. 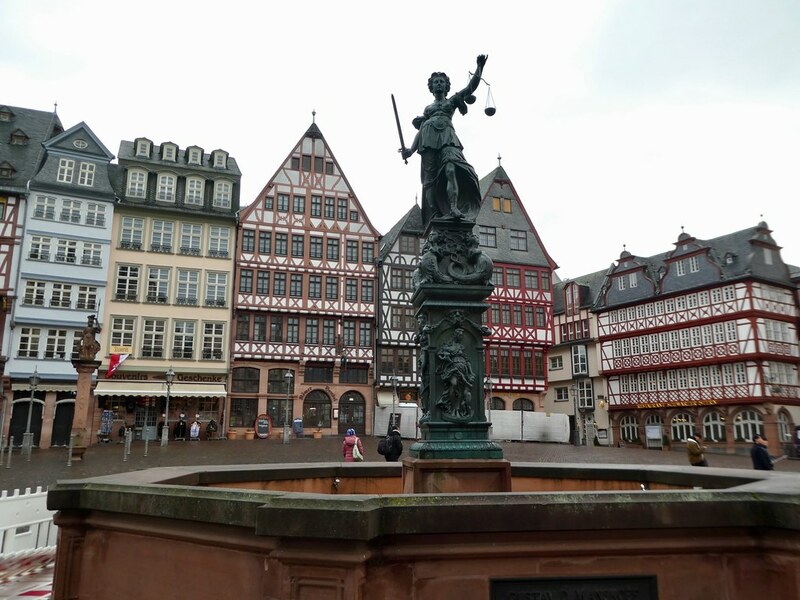 I’m adding Frankfurt to my places to visit. Thank you. That’s so nice to read, I’m certain you would enjoy a visit. Thank you for taking an interest in my series of posts on Frankfurt. Until now Frankfurt wasn’t on my radar! Thanks for all the great info! It’s my pleasure Dan, I hope you get a chance to visit soon! I’m enjoying wandering around the city with you – a real trip down memory lane. Thanks Sheree, I’m so pleased my trip to Frankfurt has brought back such happy memories for you.